Jack in the Pulpit is a common native plant of rich forests of eastern North America. It bears irregular clusters of shiny red berries in autumn. I found four berry clusters lying near each other on the ground in my garden in October. I left one berry cluster on the ground for the birds and for the propagation of new plants. I brought the other three clusters into my studio to do both a graphite drawing and this watercolor. For the watercolor, I used mostly Daniel Smith pyrrol orange, pyrrol red, anthraquinone red, quin fuchsia, and quin purple. 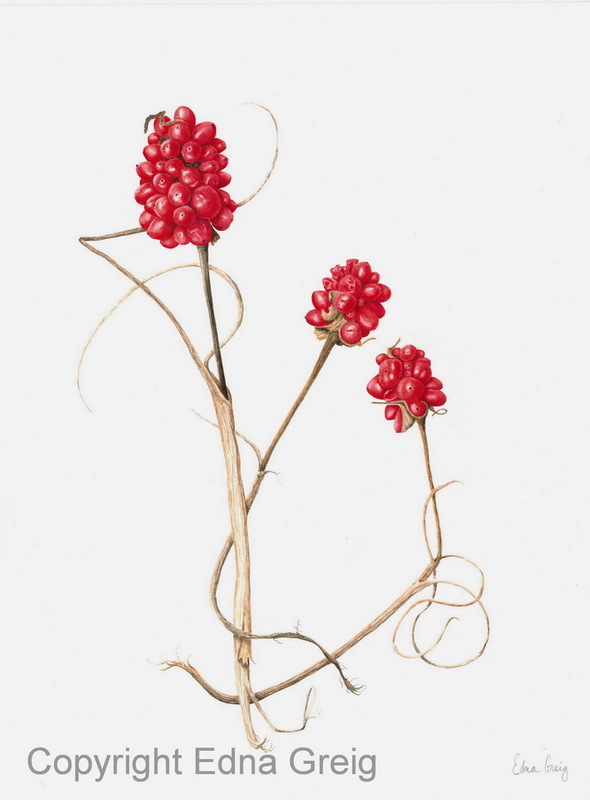 I am honored that this watercolor was accepted by the 17th Annual Botanical Art Exhibition at Filoli in Woodside, CA, that runs from March 24, 2015 through June 7, 2015.